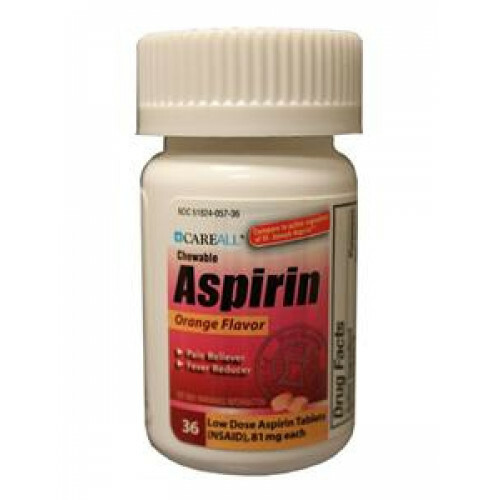 The New World Imports CareALL Aspirin Chewable Tablets is a suitable medicinal supplement made to help people who are suffering from pains such as headaches, minor toothaches, muscle aches, common cold symptoms, and swelling conditions such as arthritis. These symptoms can cause you to lax in daily activities that may require your full-on attention. While many people tend to move away from medication such as pain-killers, there are other alternatives that people can use to relieve symptoms such as muscle pains like as those treatments provided by Bengay. For those symptoms such as body aches and toothaches, you may want to just stick with an orally ingested medication instead. A nice benefit is you are provided with a low dosage of just 81 milligrams per each tablet. Instead of having to cut a tablet in half, you can simply take a low dosage tablet and proceed to consume more at a later time if needed. 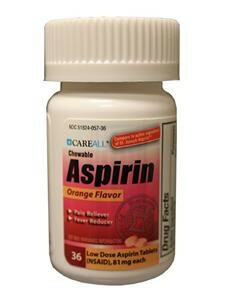 The CareALL 81 mg Chewable Orange Flavored Asprin Tablets are coated with an orange flavored non-stick seal that makes it easier to swallow though, not leaving behind a gritty taste other uncoated tablets usually do. The pain reliever is offered in a small easy to carry bottle with just 36 tablets. The small amount of provided tablets are chewable, they can soften in your mouth and do not require passing the tablets with a drink; making it convenient on-the-go aspirin. The 36 Tablets CareALL Low Dose Adult Aspirin also includes safety with its child-proof lock to deter those small hands from trying to open the chewable tablets which they can easily confuse for candy, keeping your little ones safe from these hazards.